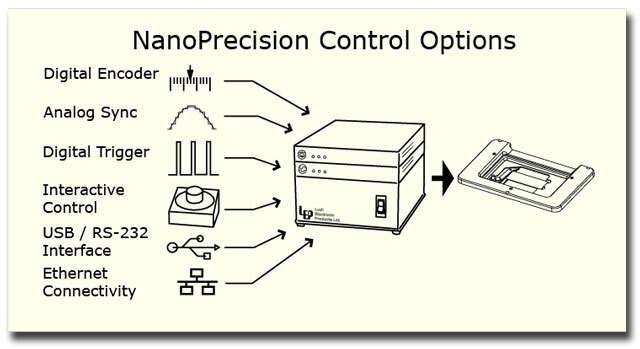 Nano Positioning | Ludl Electronic Products, Ltd. The NanoPrecision Piezo Z-stages feature the speed, resolution and accuracy of Piezo nano positioning. Each NanoPrecision device is specifically designed to suit a particular application. The LEP NanoPrecision design features a proprietary balanced displacement sensorto provide accurate high resolution position feedback. The system is uniquely designed to measure actual Z-stage displacement. This design provides the best performance in terms of stability and reliability – with variable loads and at variable frequencies. Now more than ever LEP makes the advantages of precision automation easy and convenient. The BioPrecision2 Piezo focus insert features all of the expected performance of a Piezo focus but adds improved compatibility with standard stage accessories including multi-well plate holders, slide holders, perfusion chambers and incubators. There are two versions of the LEP Piezo Z-stage. The 96A602 Piezo Z-stage has a larger aperture and accommodates industry standard specimen holders. The larger insert allows the use of many popular accessories for live cell research. The larger format also makes specimen exchange easier with less chance of upsetting sensitive samples. The 96A603 Piezo Z-stage is more compact and is compatible with standard LEP inverted stages that feature a standard (“Frame K”) opening.